I'm a bit late on this one, but it's so hilarious that I simply must tell you about it, just in case you haven't seen it yourself. This is, if you ask me, even funnier than the well-documented evolution of that Intelligent Design textbook. I hadn't actually read Richard Dawkins' blog post about the hilarious stupidity of Turkish creationist Harun Yahya's glossy but rather poorly fact-checked book "Atlas of Creation". "Harun Yahya" is the pen name of one Adnan Oktar, a leading light in the burgeoning field of Islamic creationism, in which Muslims strive to demonstrate that their newer and more vibrant religion can outdo Christianity in every field, the stupider the better. Islamic creationism has found a de facto home in Turkey, and a de facto leader in Harun/Adnan. He has a Web site. The problem Dawkins found with Atlas of Creation (instantly, upon opening the book at random) is not the usual distortions, misquotes and plain old lies that are the stock in trade of the jobbing creationist. The problem, rather, comes from the fact that the book contains many comparisons between fossil organisms and modern ones that're supposed to demonstrate that those organisms have not changed at all over millions of years. That is the entire thesis of the book. That, in itself, would only actually be an argument against evolution if it were hard to find organisms which have changed over the years, which is of course not at all the case. Environments and ecological niches tend to change, applying selective pressure to the species that live there, which then change, or become extinct. Most organisms are not ferns or crocodiles, pretty much as adequate to their task today as they were before the first mammal had drawn breath. The standard creationist tactic to deal with this awkward situation is to declare anything that looks as if it's changed to actually be two, or three, or as many as are necessary, entirely different species with no relationship at all. Any time you find a "missing link", they can therefore just say that now there are two more gaps that remain tellingly unfilled. But never mind that, because Dawkins found that the Atlas of Creation frequently fails to actually compare a fossil creature with a modern version of the same thing at all. The first such mistake he found, where he first opened the book, was the claim that a fossil eel hadn't changed at all when compared with... a modern sea snake, which is actually a very different species. There were many more. Sometimes the book fails to even compare a fossil with a living creature in the same subkingdom. But the very finest comparisons were discovered by entomologist Steve Lew. The makers of the Atlas of Creation, you see, apparently kept production costs down by just lifting pictures from all over the Internet. The problem with doing this - besides the tedious copyright-infringement stuff - is that you can't reliably tell what organism a picture is of just by looking at it. (Especially if you've got the level of knowledge about biology that's typical among famous creationists.) Go to a proper stock-photo outfit (or, in this case, some biology-photos resource, I suppose) and you're likely to find that when you ask for a picture of a caddis fly, you get a picture of a caddis fly. If, on the other hand, your image requests are made in a more informal, Google-Imagey sort of way, you may give yourself away just a teeny bit. As I write this, the third Google Images hit for "caddis fly" is from grahamowengallery.com - specifically, this page. If you go to that page, you shouldn't need even a rudimentary command of the English language to see that Graham Owen makes wonderfully realistic fake insects, using fly-tying techniques. A lot of his work is actually, in theory at least, usable for actual fishing, because it's tied around a hook like any other fly. This detail escaped the worthies putting together the Atlas of Creation. So there it is, bold as brass in the middle of their glossy book: A fly in amber in the background, and a fishing fly with a bloody great hook sticking out of its arse in the foreground. They just Photoshopped out the background of Graham Owen's picture. They also knocked off Mr Owen's "Red Hardy Spider" image from the same page. The hook's much harder to see there, but the nature of the page the image came from is just as bloody obvious. Mr Oktar spoiled all the fun by writing a reply to Richard Dawkins, a Turkish newspaper that picked up the story, all the cool kids at school who won't play with him, et cetera, complaining about Dawkins' "terrible ignorance". He argues that "whether or not it is a model makes no difference", since the picture represents something that does actually exist, and then goes on to say "The fact that demolishes evolution is that the creature has remained unchanged for millions of years and that it completely refutes evolution." Well, if it completely refutes evolution then I suppose it must demolish it as well, not to mention contradict it, destroy it, pulverise it and give it a very stern talking to. But I think I must have missed the part where evolution says that the phenotype of an organism must change over time. The only reason to think this is the case is if you believe in the frequently-espoused but completely stupid "ladder" kind of evolution, where everything's striving to get "higher" all the time, and will surely achieve this goal. This is preposterous on its face - all these billions of years, and we've still got bacteria - but it's ubiquitous in lousy sci-fi. There, "evolutionary level" is a property that can be freely pushed one way or the other, so a ray gun or a defective time machine or whatever can "de-evolve" people into apes, or "evolve" them into huge-brained psychic ectomorphs or similarly super-intelligent "beings of pure energy". If you don't get all of your knowledge of evolution from that one God-awful episode of Voyager, though, the fact that Richard Dawkins "never goes into the question of whether or not the caddis fly is still alive today" is not, as Yahya says, a dead giveaway that evolution is completely bogus. 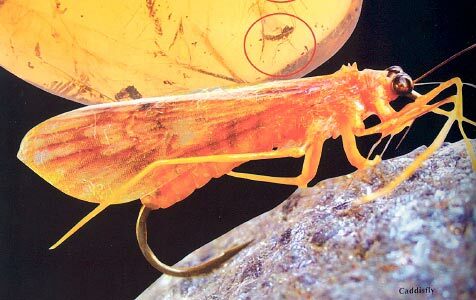 Dawkins is, I think, reasonably sure that people already know that caddis flies still exist, and that ancient ones looked much like modern ones. If there's no great selective pressure on an organism, you shouldn't expect it to change much. If a particular organism was already very well adapted to its environment, and its environment has not greatly changed, then neither does the organism. Stop me if I'm going too fast for you here, creationists. I think it still matters that they made such lousy image choices, though, because it's an entertaining case in point of the sloppiness of most, if not all, creationist arguments. Comparing fossils with unrelated animals, or fishing flies, is like your candidate making a speech in front of a picture of a military hospital... that turns out to actually be a picture of a similarly-named middle school. It shows that you're just not paying attention, even when you'll look like idiots if you get it wrong. This doesn't, of course, matter to the creationist target market, who can't be expected to make it through any book that doesn't have pretty pictures (frequently including whatever holy book they claim to so fervently believe). Oktar's probably a bit too busy to start shooting off more lawsuits at the moment, since he's appealing his recent conviction for "creating an illegal organization for personal gain"; this is the latest instalment of a particularly distasteful story. Once Oktar's dealt with his little legal problem, though, I presume he'll issue a flurry of lawsuits demanding that every site that's discussed this tragically hilarious story also be blocked in Turkey. Sooner or later, Turkish Web browsers will only let you see harunyahya.com and discovery.org. Hoping you're having a great weekend, and thank you for your email. Creationists? Behing *dishonest* about their case? Who would have thought! Absolutely, and it's a real problem that the Turkish Govt is so quick to ban websites. But I worry about Dawkins. He's got obsessed with Creationism, and at best I think he's more likely to give it publicity than damage it. I mean, these people aren't very open to rational debate, else they wouldn't have such crap theology. I also don't much respect Dawkins's arguments about religion: specifically his refusal to regard any half-way grown-up form of theism as anything but cover for Fundamentalism. I mean, the present Archbish. of Canterbury and, say, L. Wittgenstein (deceased) aren't really disposed of by sneers and guilt by association (assuming that L. W. was some kind of, at least, fellow traveller of some kind of very sophisticated and/or abstract theism, which seems plausible). It's all good fun, up to a point, but the world was happier when the Creationists were just dismissed with a tolerant aside; "Bless," as it were, like the Flat Earthers (also a 19th century lunacy). I know they're dangerous, in the US, but they feed on controversy. I hate to defend the science of any Star Trek episode, let alone a Voyager one, let alone one of the most despised Voyager episodes, but... doesn't that one show evolution heading towards big ole salamanders, not super-humans?